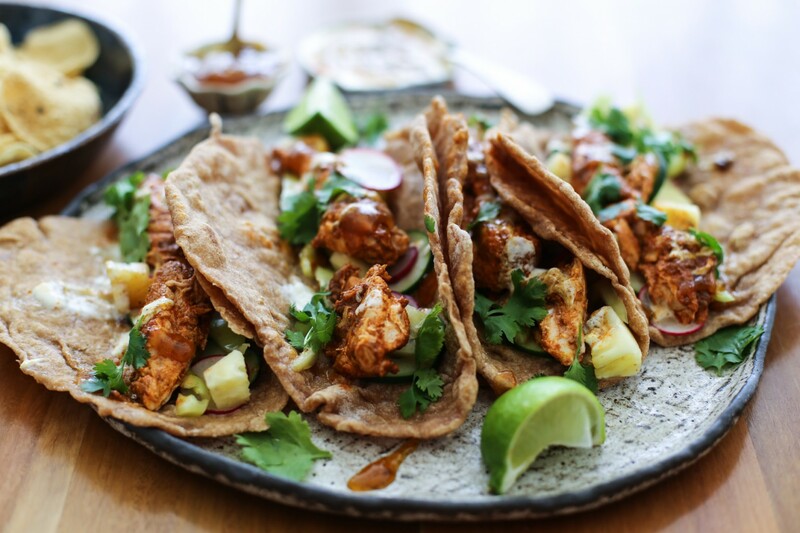 Now I love tandoori, I love fish and I love tacos. So that means I triple love this dish. So when Pataks sent me the tandoori paste and the yummy sides I somehow brainstormed my way to Tandoori Fish Tacos. The flavours of the spices and fresh white fish go perfectly together. 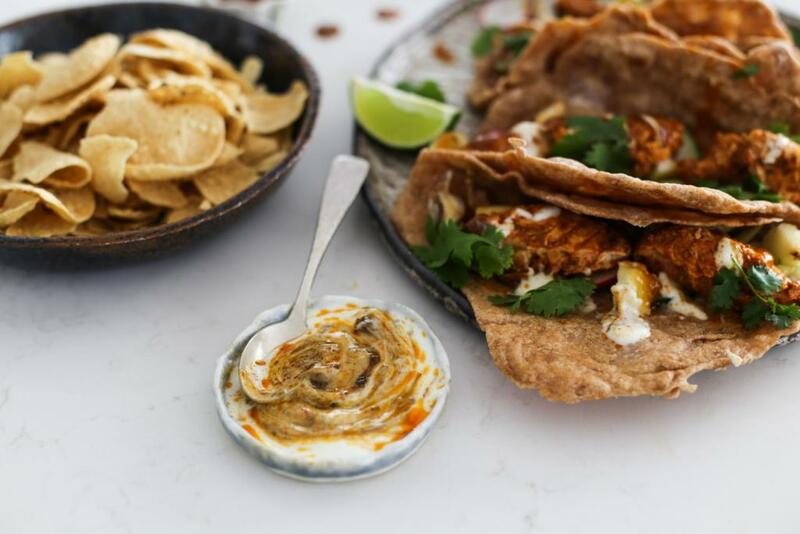 A delicious twist on the usual tandoori chicken. 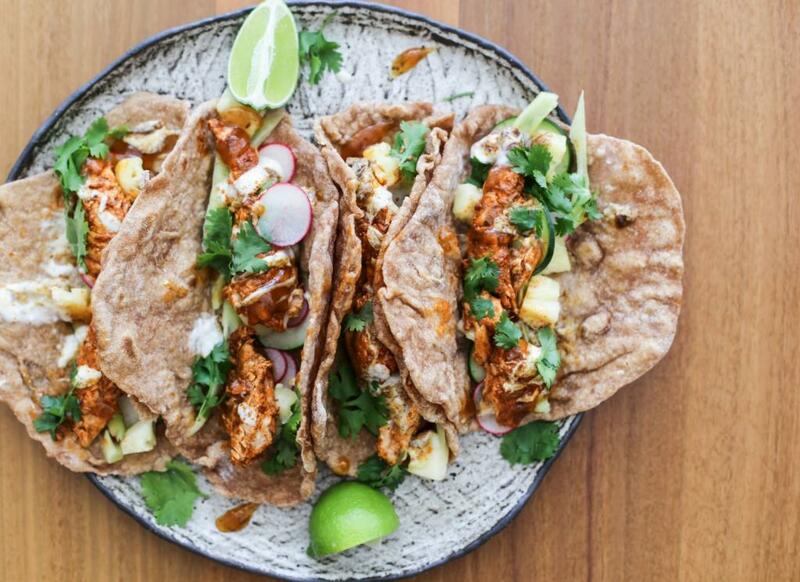 These tacos and sides are a beautiful, tasty combination of carbs, protein and fat. A great combo go all the macronutrients. Fresh crunchy vegetables, melt in your mouth spiced fish, soft yet hearty wraps. And the sauces are not to be forgotten. I ate about half the pappadums and eggplant pickle dip whilst I was cooking. Just pure yum. I think i’ll be making that dip for a lot of different meals. Now these homemade wraps are something that I make all the time. Hardly any ingredients unlike some in the supermarket so they are a lot better for you, anddddd you can bet they are a lot of cheaper. So I usually make a big batch of them and freeze them and voila, you have the base of many great dishes ready to go. 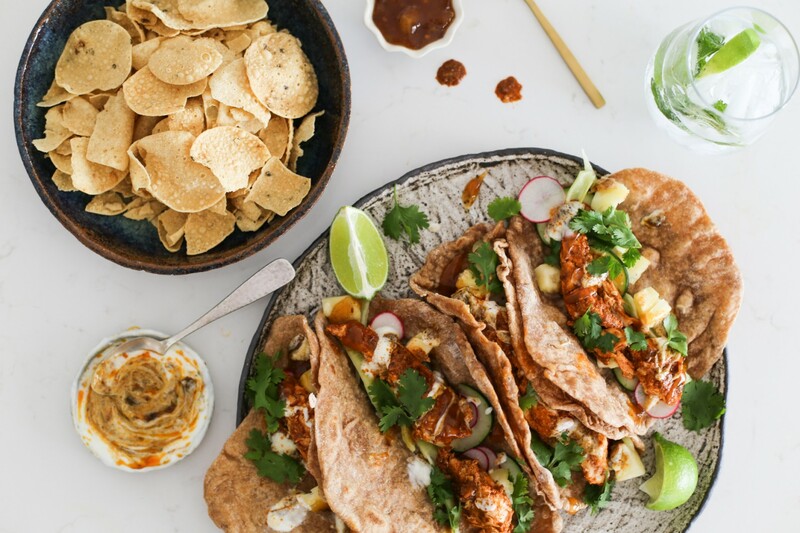 The best thing is all these sauces can be found in your local supermarket so you don’t have to go hunting like crazy to recreate these tacos. They are definitely the perfect weekend lunch, particularly sitting outside with an icy drink. So hop to it and pick up some snapper and sauces on your home, it’s taco time! In other news, it is now 3 weeks until we move into our new home. Literally buzzing with excitement to be in there. I can cook in my miele appliances, decorate my study and just breathe a sigh of relief that we finally made it. Actually, I think there will be tears of joy, a sigh of relief definitely doesn’t cut it. Mix tandoori paste onto the snapper and set aside in the fridge for 20 minutes. Make the wraps, sift flour into bowl, add baking powder and stir, then add warm water and oil and mix until a shaggy dough starts to form. Roll into little balls, whatever size wraps you desire. Slice up vegetables and set aside. Place snapper in a pan and fry for a few minutes a side – depends on how thick the fillet is. Once fish is flaky pull off the heat break into smaller chunks and start assembling the tacos.